Airocle’s 1 Series ridge and slope roof ventilators are energy efficient, environmentally friendly, economical and ultra low-profile. Optimizing building airflow naturally, our 1 Series super low line ridge & slope ventilators utilise thermodynamic forces to draw exhaust. Engineered to rigorous scientific standards, they provide effective solutions for extracting airborne waste and heat from all types of commercial and industrial buildings. Correctly incorporated into a project’s ventilation scheme, our 1 Series roof ventilators embrace the occurrence of natural stack action. Modern and unobtrusive design enhances the aesthetics of your project – without imposing wind load or dead load to the building structure. Particularly suitable for the extraction of low to medium heat loads, Airocle’s super low profile ridge natural roof ventilators are adaptable for use on all profiles of roof sheeting. Airocle understands every project has its own, unique demands. 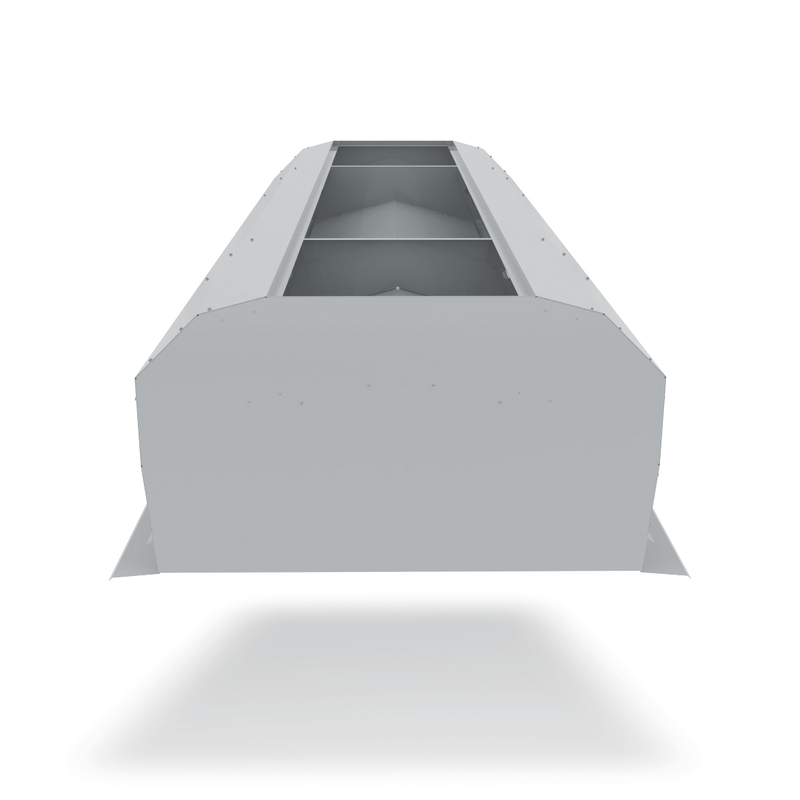 Airocle’s super low profile slope roof ventilators are ideal for situations in existing buildings where purlins are centred too close to install ridge ventilators. Airocle’s team of qualified engineers design natural ventilation solutions to optimize the amenity of buildings, even in the most challenging environments. Modern, ultra-low profile design enhances the aesthetic appearance of your project. Our natural extract ventilation systems are effective and efficient when it comes to future energy use – we make to most of the forces of nature. Ventilators are storm-proof and capable of withstanding wind loads of 2.23kPa. Our proven engineered design has been tested by CSIRO to AS2428 Parts 1 & 2 (Wind and Rain) at 55m/s. An inlet ratio of 1.5 : 1 (inlet:discharge) is recommended, however Airocle can consult on developing optimal custom ventilation schemes suiting your project requirements. In May, 2006, the Federal Government tightened energy efficiency requirements for all projects implemented via the Building Code of Australia. Airocle’s natural ventilation systems provide sustainable, energy efficient ventilation for any project – the perfect design solution for the future. The use of natural ventilation provides numerous benefits resulting in better profits for any business and their facility; including increased occupant comfortability and decreased running costs. Manufactured in accordance to AS2427-1983, all 1 Series roof ventilators are supplied in complete knocked-down form; packed and ready for hoisting. Ventilators are shipped with all necessary stop-ends and fixings needed to assemble the vent. Tradesmen will find there is no need for extra framework or complex flashings, and experience the fast and easy meccano-like assembly. Components are manufactured in Zincalume. Roof ventilators are assembled in standard 3050mm lengths for Super Low Profile Ridge Ventilators and 2400mm lengths for Super Low Profile Slope Ventilators – unless otherwise stated. 1 Series roof ventilators use efficient design coupled with natural science. This means, once installed, they’re able to operate with virtually no running or maintenance costs, providing long-term operational savings for both the building and the environment. Here at Airocle, our vast experience enables us to advise on the most efficient design for your project. Contact us for a no-obligation site survey and quote relating to either existing buildings or building plans for proposed buildings. Full test results to AS2428.1 & 2 (Rain & Wind), .4 (Fire) and .5 (Coefficient of discharge) are available from Airocle.